True friends sometimes quarrel, but will never part. 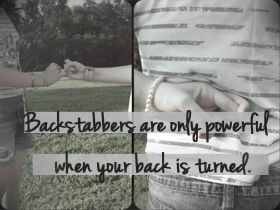 Fake friends will always smile with you but will keep stabbing you at the back. My back is not a voicemail. If you have something to say, say it to my face. Beware the FRENEMY; enemy disguised as friend who pretends to look after your interests but really loves it when things turn sour for you. We fear our enemy but the bigger and real fear is that of a fake friend who is sweetest to your face and most vile behind your back. Never trust someone easily. You'll never know, they may be allies of your greatest enemy. Best way to keep your secrets from your enemies is to stop telling your friends. Let them talk all they want behind your back, you know they'll eventually shut up the moment they hear the sound of your footsteps. An old friend of mine once told me, stop feeding the snake around your neck, one day it will grow strong enough to strangle you. How did she know? Guess it takes a snake to know one. An honest enemy is always better than a friend who lies. Pay less attention to what people say and more attention to what they do. Their actions will show you the truth!